Thank you Mirch! On the cachet is the Vace Situla, a 5th cent. BCE Iron Age vessel made of bronze. 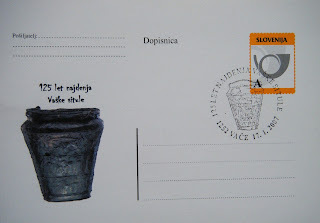 It is the best known object from the Hallstatt archaeological site. This postal stationery celebrates 125 years since farmer Janez Grilc excavated it. The bas-relief shows warriors and animals, and was found in a grave of a young adult male who was interred with spears, a helmet, an axe and an armband.